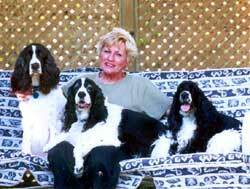 We are a well established obedience training organization with facilities in downtown Toronto and Scarborough. Through strictly humane methods, we have been teaching obedience for some 25 years, with an emphasis on "kindness" and working within the dog's own spirit. Proficiency at all levels of training is achieved void of food, resulting in an increase in bonding and a willingness to please. We are BIG on PRAISE! Not only will your dog learn both the hand signals and verbal commands in a kind manner and from the first level of training, but you will learn to "speak dog" and "read your dog". All training is done to the standards of the Canadian Kennel Club (CKC). Instructors at Mother Knows Best Obedience School are members of the Canadian Kennel Club (CKC) and the Canadian Association of Professional Dog Trainers (CAPPDT). The expertise and proficiency of our Chief Instructor, Dorothy Avery, has been conveyed and attested to through requested appearances on CTV's 5:00 O'Clock News, as well as their two hour Breakfast T.V. Show, her many published articles on dog obedience, and interviews with the Toronto Sun, the Toronto Star, EYE Newspaper, and City Dog Magazine. Dorothy also holds a certificate in Emergency First Aid For Pets. Booking of classes, or general inquiries, may be made simply by contacting Dorothy at (416) 421-6019. If Dorothy is not available, please leave a message - she has NEVER failed to return a call within a maximum of 8 hours.